Live action in the nights before the Masquerade. 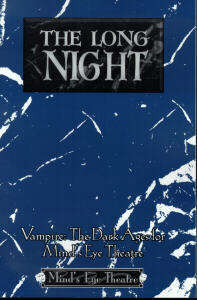 The Long Night takes you into the Dark Medieval world and turns you loose on the stage of your imagination. With information on the clans and bloodlines of Vampire: The Dark Ages, this is the essential resource for Mind's Eye Theatre players and Storytellers who want to rise to the Long Night.